Heading out and about tomorrow? Why not swing into Outback Steakhouse for something to eat! And while you are there make sure you say the words "Outback Bowl" to your server because that will score you a free appetizer. What will the appetizer be? It depends on the results of the game! 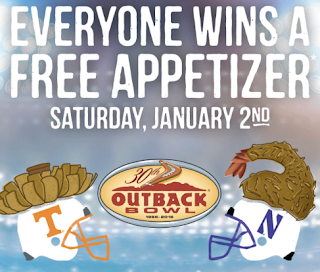 If Tennessee Volunteers win it'll be a Free Bloomin Onion. If the Northwestern Wildcats win it'll be a Free Coconut Shrimp. Either way it sounds great to me! Click on the picture below for more information!